Peyton Manning has improved his deep passing in his last four games.Peyton Manning’s arm strength was questioned early in the season as he was coming back from neck surgery, especially when he struggled to make downfield throws in his first two games. Manning failed to complete each of his five attempts on throws traveling more than 20 yards downfield over that span, which included three interceptions on such throws against the Atlanta Falcons on Monday Night Football. He has silenced the critics since Week 2, completing 11-of-17 deep passes with four touchdowns and zero interceptions. Manning has notably showcased his strong arm on downfield throws against a split-safety defense, where the window downfield is smaller with two safeties deep in pass coverage trying to take away the deep ball (split-safety defense is defined as two safeties deep in pass coverage). Over his first two games, Manning attempted just two passes on throws more than 20 yards downfield against a split-safety look, resulting in two interceptions against the Falcons. In his four games since, Manning has completed 4-of-7 attempts against such coverage on throws more than 20 yards downfield, with two touchdowns. Brandon Stokley has benefitted from Manning’s recent success on deep passes, catching both of his targets on throws of such distance for touchdowns since Week 2. 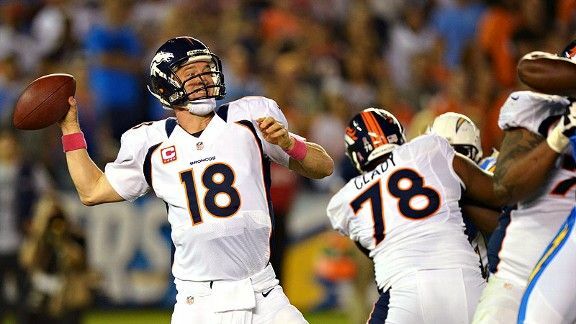 Manning beat split-safety coverage against the Houston Texans in Week 3 and connected with Stokley on a 38-yard touchdown. Manning placed the ball perfectly over the head of Texans cornerback Brice McCain and strong safety Quintin Demps, showcasing his arm strength on tight coverage downfield. Manning has been successful targeting Stokley this season, especially when he is lined up as a slot receiver. Stokley has caught 83 percent of his targets when lined up in the slot this season, the third-highest catch percentage of any receiver with a minimum of 10 targets. Over his last four games, he has caught all 14 of his targets from Manning when lined up in that position, including three touchdowns. The Saints could have their hands full with the duo on Sunday. New Orleans ranks among the bottom 10 teams in the league in receptions, receiving yards, touchdowns and first downs allowed to receivers lined up in the slot this season.